Simon Mall sells gift cards are a great way to manufacture spend. We are able to purchase several thousand dollars of these gift cards at one time and liquidate them using prepaid cards such as Serve and Bluebird to earn miles and points. According to the note this particular Simon mall location will stop selling Gift cards starting March 1st 2016. It is still a few months away but may change the way a lot of us do manufactured spending. I am not certain if this will be implemented nationwide at every Simon Mall location I guess we will have to wait and see. When I asked the rep reason behind it she was very vague and mentioned that a new company is probably taking over the gift card division. I guess we will have a better picture here in the next few days. 1. 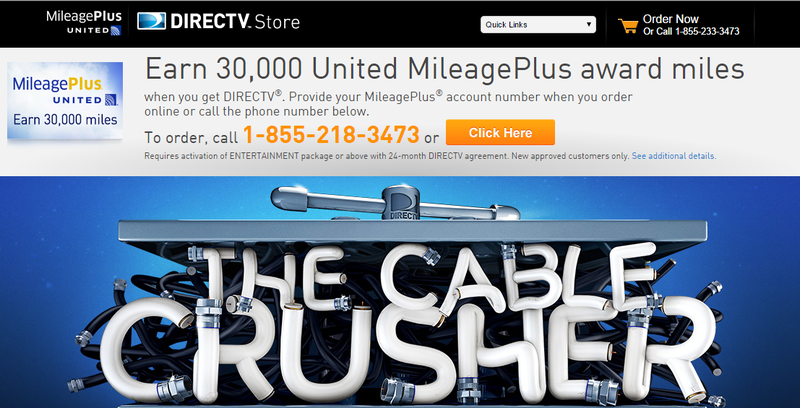 I just received an email that United is offering 30,000 Miles with a new Direct TV account and a 2-year contract. This best offer I’ve seen has been for 25,000 miles so the 30,000 mile offer is definitely a better deal. 30,000 miles will easily get you a round-trip domestic ticket. If you already have direct TV and your current contract is coming to an end, you can apply for a new account under your spouse or partners name and earn 30,000 miles. More details on this offer are here. The offer is valid until 7/22/15. 2. Redcard Update – I wrote on the demise of free credit card loading at Target Yesterday. Today (5/6), I was at a local area store in Richmond, VA and credit card loads are a no go. However, folks via flyertalk and other forums have reported success using Simon Mall Gift Debit gift cards. This may not be as lucrative as free loading but can still help you with minimum spending and if you do what I do i.e buying the simon gift cards using Barclays Arrival World Mastercard or the Capital One Venture Rewards Credit Card where you earn 2x miles n every dollar spend and redeem earned miles for travel credit. This may also help you with the minimum spending on any new credit card to earn large sign-up bonus. You can buy gift cards upto $500 by paying $3.95 purchase fees for each card. You can find location of the nearest Simon mall here and the cards are usually sold at customer service desk inside the mall. Simon gift cards are pin enabled and the default pin is last four digits of the debit card. The Simon mall in Richmond allows you to buy up to $10,000 worth of gift cards per day but it is very ymmv at each location. Another experiment I need to do is try loading on the redcard the last $500 Amex Gift Card that I purchased from Topcash back for a profit of $100. I will keep you posted with any more data points. Please do share your experience and any tips.